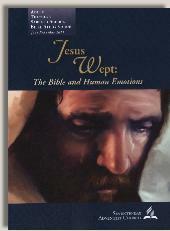 The Sabbath School Quarterly for the first quarter of 2011 takes as its departure the shortest verse in the Bible, John 11:35, “Jesus wept.” It is true that emotions as humans experience them are a large part of what makes us human; however it is not correct to state that this (and our ability to reason) is what makes us different from the animal kingdom. We are different from “frogs, dogs, caterpillars, and donkeys” not only because of our ability to reason and our emotions, (P. 2 of the Teacher’s Quarterly) but primarily because of whose image in which we were created. We are completely different beings from these other creatures as much as we are different beings than God. Not that animals were created in our image, that would also be wrong, but we are spirits that inhabit a body, which the animals are not. We were created to fellowship with God as beings that will live forever, not just as beings that have emotion and reason. The Bible is not a book about how to bring our emotions under his divine sovereignty. Of course, it is important for Christians to learn about their emotions and learn that we have control over our emotions, rather than letting our emotions be in control of our actions. But these very things are not what the Bible is about. The Bible is a telling of God’s original plan for us, how we have fallen from that original plan, and how God intends to rescue us from the fallen state into which we are born (Christ and him crucified, First Corinthians 2:2). Perusing the Quarterly, one gets the distinct impression that Jesus is supposed to be our ultimate example to follow in learning how to gain control over our emotions. The last lesson in the quarterly identifies characteristics of Jesus’ life and how those can be used by us to overcome our emotions. Jesus is identified as “The Praying Lord” (p. 150), one who participated in “Worship and Church Community” (p. 152), one who practiced “Forgiveness” (p. 154), one who was in “Service” to his fellow man (p. 156), and one who had “Hope and Trust in God” (p. 158). Although these are all beautiful traits of our Lord, we would be amiss to suggest that practicing these things as he did would bring balance and harmony to our emotional and psychological lives. None of these are the answer to our broken emotions. The cross and Christ crucified is the true answer to our brokenness, both emotional and spiritual. the Lord, who has bestowed on us the greatest emotion of all: love. We do not love others by having correct emotions. We love others by sharing about the “propitiation” of Christ, the complete and final payment Jesus made on the cross for us. We are, today, thousands of years from the “tree of life” (Gen. 2:9). The DNA is wearing thin. We’re damaged goods, and, contrary to the myths of evolution, we’re getting only worse. Evolution is, of course, a myth, a human device to allow us to ignore God’s calling us back to himself throughout human history. However, to suggest that our “DNA is wearing thin” is also an excuse. If our DNA is wearing thin, how can we be held accountable to the standard of righteousness that God requires us? Our DNA is not wearing thin. We are, as Adam and Eve were after the Fall, in need of a rescue that is beyond our ability to grasp. This is the good news of the Gospel of Jesus Christ. He has broken into our world, taking on human flesh, to bring us, if we accept it, back to himself. A study of the emotions of humans found in the Bible may be an interesting study to some; however it is incorrect to suggest that the Bible is the answer book for dealing with human emotion. The Bible is the answer book for dealing with our sinfulness and directing us to the cross to accept the one and only rescue that God has provided for us in his Son. Do you have eternal life? If so, make sure that you are sharing this offer with others, both within and outside of your Church. If not, why not make a commitment to accept his offer right now? We look forward to studying with you this quarter. As usual, if you have any questions, we gladly accept your emails and look forward to corresponding with you. 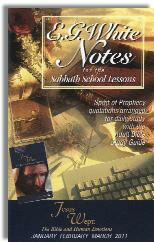 You can email us at this address: BibleStudiesForAdventists@gmail.com . Copyright 2010 BibleStudiesForAdventists.com. All rights reserved. Revised December 25, 2010. This website is published by Life Assurance Ministries, Glendale, Arizona, USA, the publisher of Proclamation! Magazine. Contact email: BibleStudiesForAdventists@gmail.com.